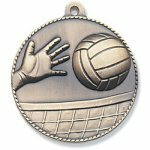 This fun and economic 1 3/4" Volleyball Wreath Medallion in antique gold features a classic wreath motif accented by stars with action packed designs at a price that can't be beat! Available in Antique gold our Highly crafted medallion utilizes a 3D die cast process to give it the regal look and feel. 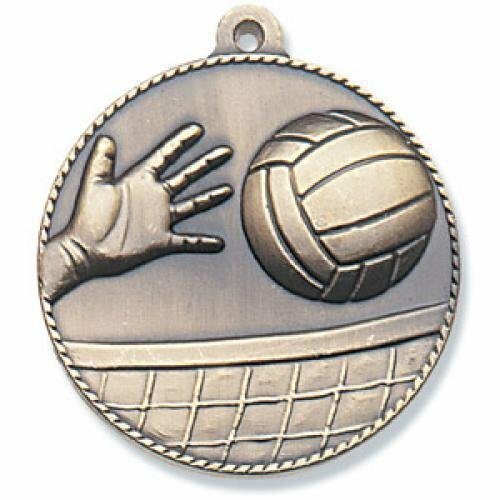 Utilize any 1 of our 18 stock Mylar rings (MR1-MR55) to finish this medallion. Each medallion has a smooth finish on the back for engraving. Finish it off with any of our Neckbands or Ribbon drapes.